Looking to lose weight fast and improve your health? The ketogenic or keto diet may be just for you. Not only does this low carb diet help your body feel amazing but because of the high fat content you will feel full for longer. No more hunger when dieting! The fat bombs are an essential part of this diet to help you achieve that Low Carb High Fat ratio. Also they are considered to be Keto Treats, because they taste amazing and can help you deal with sugar cravings. In this fat bomb explained post I am giving you EVERYTHING you need to know about keto fat bombs and how they can assist you to lose weight and stay healthy! 2.4 What Is A Fat Bomb? 2.5 How Many Fat Bombs Can You Eat Per Day? 3.3.10 10. Chipotle Bacon Wrapped Chicken Bites from Low Carb Maven. The basis of the Keto diet is getting your body into Ketosis by eating a Low Carb High-Fat diet (LCHF). Your body will naturally start to use fat as an energy source instead of sugar/carbs. We noticed that we felt lighter and clearer headed on the keto diet. There are so many benefits to this healthy eating plan. You will lose weight FAST and in a healthy way. The high fat will naturally fill you up and reduce your appetite. Energy levels will increase, brain function will improve and you help lower risk factors for diseases such as diabetes, heart disease and strokes. Some people may experience keto flu when they first start eating LCHF. You could get headaches, feel fatigued and have issues such as nausea and stomach cramps. This will all pass so stick with it. Other problems may be constipation and low nutrients such as Calcium, Potassium, and Magnesium. To combat this you need to make sure you eat wholesome foods high in these nutrients and also fiber. As with any new eating plan, it is wise to consult your doctor before you start. Want to learn more about the keto diet or are looking for amazing low carb recipes to try? Find out the best keto diet books here. It is more than likely you have grown up learning fat is bad for you and will lead to weight gain. But now research is showing us that the right kind of fat is good for you and even better, the right fat will help you lose weight! So, what is a fat bomb exactly? Similar to energy balls or keto protein balls but instead full of goodness from high-fat, low-carb ingredients. 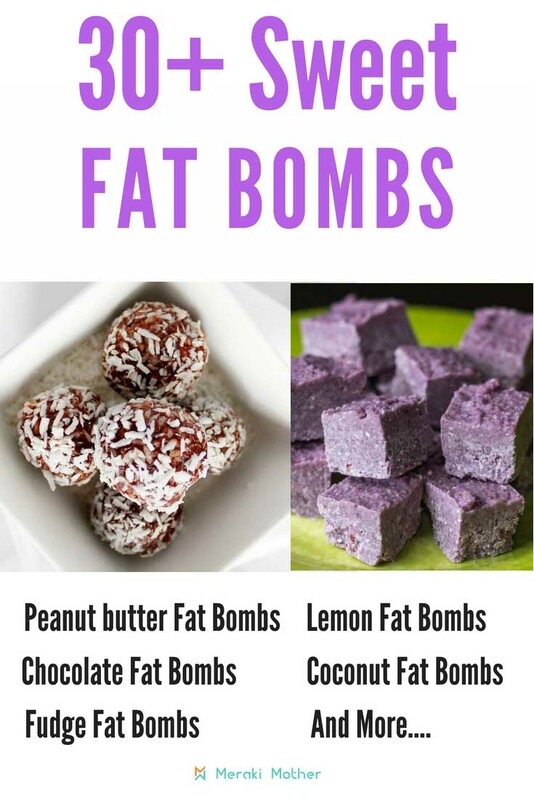 Fat Bombs contain ingredients such as coconut, nut butters, avocado, and diary-like butter and cream. How Many Fat Bombs Can You Eat Per Day? It is important to note that Fat Bombs must be eaten in moderation. When you make a batch of these delicious keto snacks it can be tempting to eat more than your body needs. Be sure to only eat one or two of these fat bombs and store the rest for a fast keto snack. They are packed with energy and good fats but they also have many calories and the carbs could add up too. Read on to learn how to make fat balls for ketosis. Creating your own delicious fat bombs is not as difficult as you may think. In fact, there is usually only three easy steps to make a fat bomb. A Healthy Fat – This can be nut butters, peanut butter, coconut products, avocado, ghee, or bacon fat. Flavor – Think healthy and nutritional tastes such as spices like cinnamon, turmeric or Himalayan Pink Salt. Cacao or extracts like Vanilla and Peppermint. Texture- create a full sensory experience with crushed nuts, bacon pieces, chia seeds or shredded coconut. The healthiest way to use nut butter such as peanut butter is to make the butter yourself and not use the industrialized version. If you make a peanut butter bomb recipe with store bought product, first check how much sugar and carbs they have. You can make butter out of any nuts, check this post here to learn more. If you want to add some extra health benefits to your fat bomb. Perfect Keto have amazing products like Keto Collagen that help you get improved digestion and better hair & nails, skin and joints. To make a fat bomb just mix all the ingredients together (some oils make need melting first), shape into balls either by hand or by using a chocolate bomb mould. 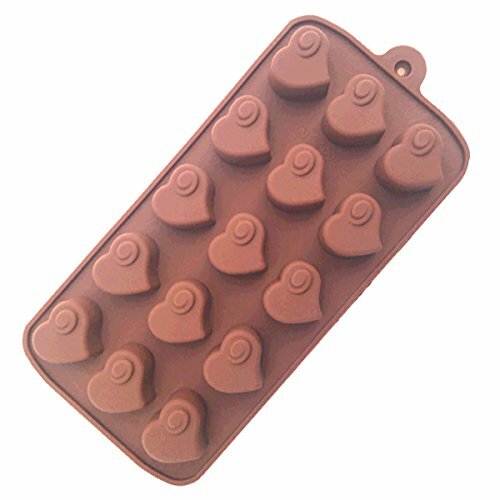 We LOVE this gorgeous fun shaped fat bomb molds. Lastly either cook, pop in the fridge or freeze your fat bomb depending on the ingredients you have used. 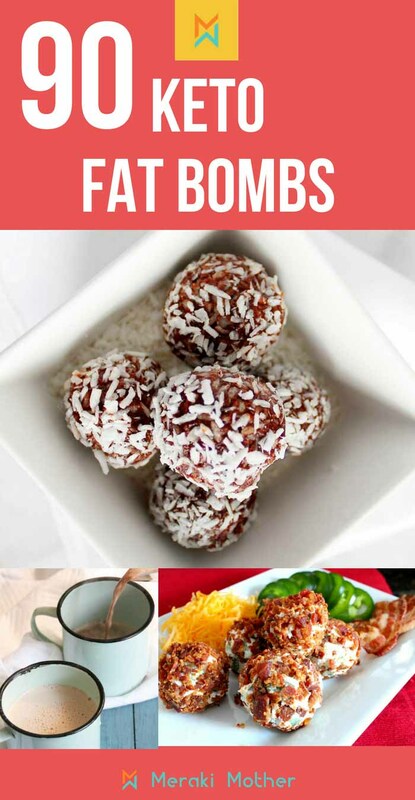 If you need some amazing fat bomb recipe inspiration check out these best keto fat bomb recipes. The sweet fat bombs on a low carb can be the hero to beat that sugar craving feeling that can bother you in the beginning of a Keto diet. Your body does get used to having less carbs and sugar but it is good to know you don’t need to give up on every single treat for this diet. A little adaption of a traditional recipe might be enough to maintain your ketosis. Find below the best easy keto fat bomb recipes that can be used as treats, snacks or desserts on a ketogenic diet. 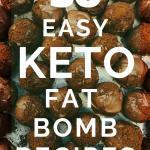 Try our very own Chocolate Keto Fat Bomb recipe. When it comes to keto fat bombs chocolate and coconut are a dream mixture! This delicious chocolate bomb recipe makes a rich, chocolately and very filling snack. Perfect for after a meal or just as a Ketogenic snack in-between meals. You can find the full tutorial to this Keto chocolate coconut fat bombs here. Looking for yummy fat bomb keto snacks? These delicious cheesecake balls from Brea Getting Fit will make you forget you are on a diet! Add the homemade Nutella ingredient to any fat ball and you will make the best bomb dessert recipe. Check this gorgeous recipe from Have Butter Will Travel. 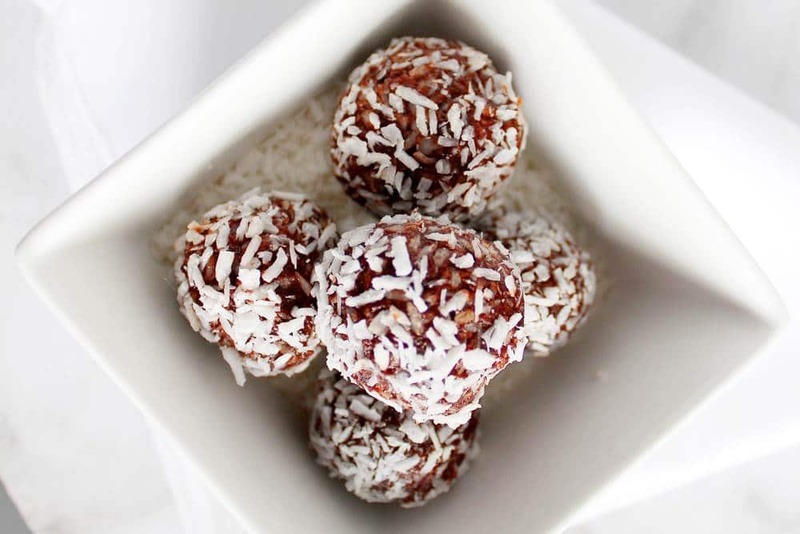 This coconut bomb recipe is sugar, gluten, dairy and grain free! What more can you ask for? Check this recipe by Delicious Obsessions now. Fancy a little piece of fudge without going off your ketosis? Then this sweet bomb from Real Balanced is the perfect recipe for you. Make your Keto coffee bomb out of your bulletproof coffee. How brilliant an idea it that? Check the tutorial from A Girl Worth Saving. Such a great recipe for the warmer months. Boost your fat intake with this rich and tropical taste from Forget Sugar Friday. 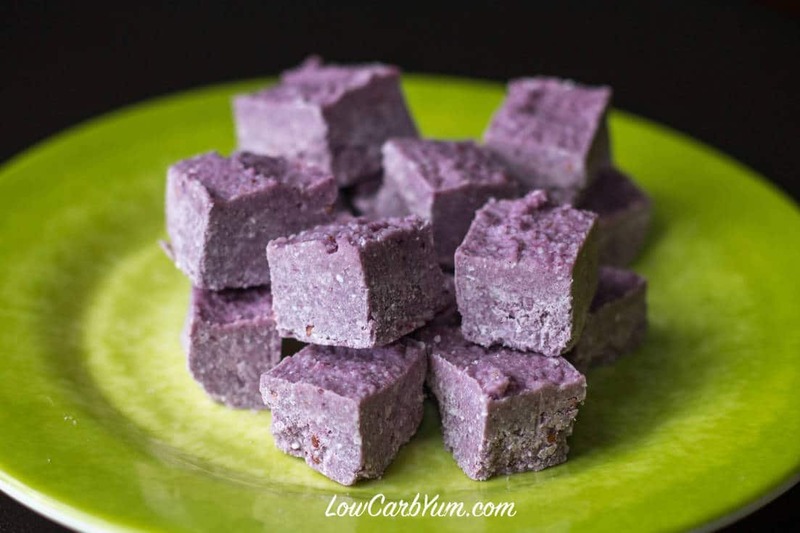 Yummy dairy free fat bomb recipe using coconut oil by Low Carb Yum. If you are crazy for pistachio like we are you will love these almond and pistachio Keto fat balls from The Healthy Foodie. Perfect fat bombs for Fall. Follow the link to learn how to make the apple pie energy balls from Real Food RN. This recipe is ready in no time. Make these creamy fat bombs made with Perfect Keto MCT Oil Powder, to go today. Check out this recipe from Perfect Keto. Can you eat peanut butter on keto diet? Yes, you can! Peanut butter chocolate fat bombs are seriously yummy. Love this peanut bomb recipe from Low Carb Yum. The lime gives that tangy taste and makes a recipe that is not so sweet but still perfect as fat bombs for sugar cravings. Check this recipe by Health, Home & Happiness. This nut butter bomb recipe from Raia’s Recipes is seriously easy. To make it more keto friendly just replace honey for swerve or erythritol. Let’s Eat Cake has this super delicious recipe using avocado, which is the best fruit to eat on keto diet due to its very low carb quantity. Grass Fed Girl shows how to make these Coconut and Cinnamon Keto Fat Bombs which are so delicious they are like a coconut bomb cake recipe! Looking for low carb fat bomb recipes using Match Green tea? Then look no further and try this lovely recipe from The Healthy Foodie. Perfect cooling treat for a warm day. Try these peanut butter whips from Low Carb Yum. This coconut, lime and lemon fat bomb recipe from Delicious Obsessions is tangy and a little bit sweet, a great little snack when you need something sweet to taste. We love low carb fat bomb recipes that involve no cooking and these tangy No Bake Lemon Mini Tarts by Carb Wars are perfect when you don’t want to have to bake. Looking for a fat bomb recipe with coconut oil? These tasty Keto Fat Bomb Pumpkin Pie Patties from Healthful Pursuit not only use coconut oil but have the warm yummy tastes of fall. Fancy some chocolate chip cookie cough fat bombs with peanut butter? Then follow this tutorial here from Fit Mom Journey. This Powdered Donut Hole Fat Bomb recipe by Real Balanced is a great fat bomb recipe using Monk Fruit as a sweetner. If you haven’t tried Monk Fruit yet, give this a try. 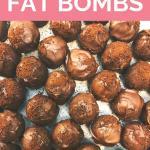 One of the best chocolate fat bomb recipes I have seen. Learn how to make them at Dirty Floor Diaries. It can be hard to believe that these Cinnamon Bun Fat Bomb Bars by Ditch The Wheat are a fat burning bomb, they just taste too good. It is amazing how many gorgeous variations of keto chocolate bombs that one can make. This Macadamia chocolate recipe from The Nourished Caveman is da bomb! How can you resist these keto peanut butter cream cheese balls? Too delicious to pass. You can learn how to make them at eatwell101. If you need some delicious bomb desserts, these Peppermint Fat Bombs by Ditch the Carbs are sure to stop all sugar cravings. Not only are they Keto but these Pecan Pie Fat Bombs by Bakerita make great fatbombs LCHF. This easy 3 ingredient, Crispy Butterscotch Fat Bomb by Maria Mind Body Health is a zero carb fat bomb! Just what we love to hear when we are looking for an easy keto snack. It doesn’t get any easier than this simple but yummy and rich 3-Ingredient recipe from eatwell101. Just starting your Keto journey? Head here to find a comprehensive explanation of Keto and how you can get healthy and lean. 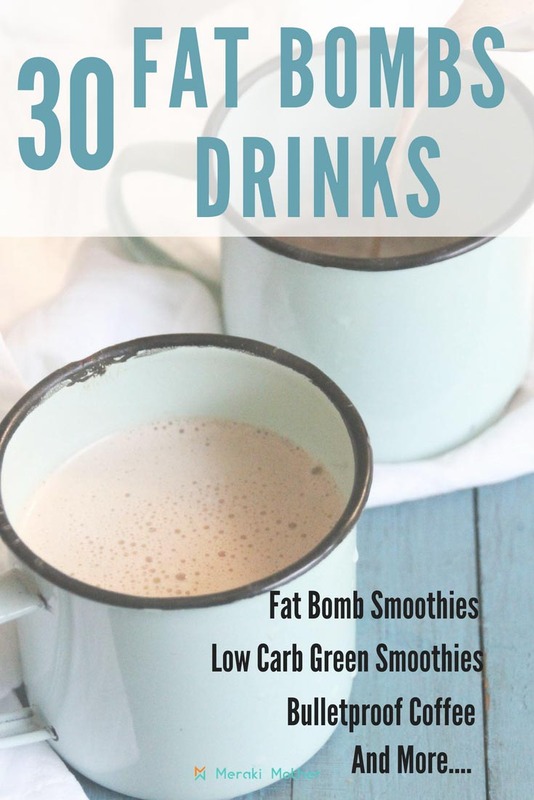 If you prefer taking your good fats in the form of drinks instead of little balls or bars you can check below our list of best bomb drinks you can include on your keto menu. A great alternative from those who don’t like the bulletproof coffee or prefer a non caffeine option. 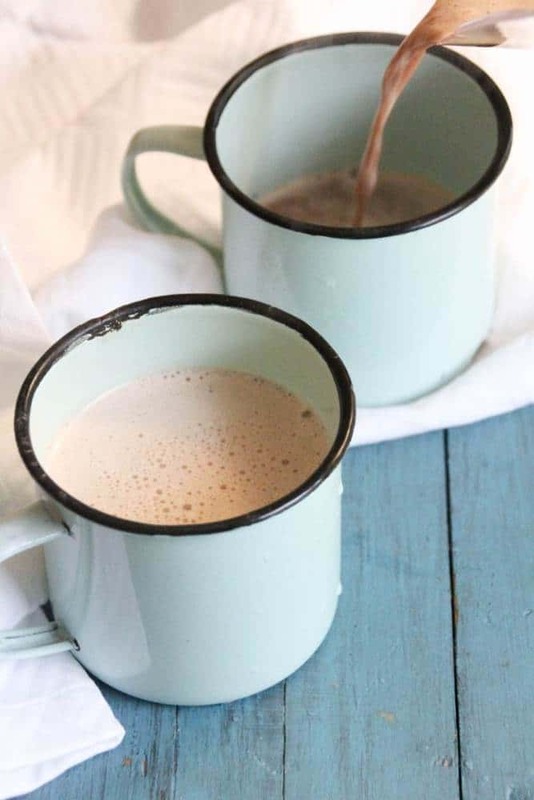 Check out this hot cocoa recipe from A Girl Worth Saving. Want to turn your normal coffee into a coffee fat bomb? Then follow this recipe from Keto Diet to make the ultimate coffee bomb recipe. This Coffee Bomb Weight Loss Smoothie by Forget Sugar Friday can’t get any better after adding vanilla Ice cream. So yummy. Tired of the tradition chocolate peanut butter fat bombs on your keto diet? Try this low carb milkshake to shake things around. Recipe from Low Carb Yum. This dairy-free option from All Day I Dream About Food has less than 5g of net carbohydrates, therefore it is a delicious indulgence that will keep you in ketosis. It is not just low carb chocolate fat bombs that are great to stop those hunger pangs. Having a liquid fat bomb like this Chocolate Green Smoothie by Ditch The Carbs is perfect to have between meals as a keto treat. This Keto Breakfast Smoothie by Essential Keto is such an easy and healthy way to start your day on the keto diet. It is also perfect for a keto breakfast on the go. We think this Keto Smoothie-Blueberry Galaxy from Fat For Weightloss is one of the best bomb drinks. Full of Blueberries, which we all know is an amazing Superfood. If you love a shake for breakfast then you wont want to miss this Keto cinnamon almond butter shake by I Breathe I’m Hungry. Can you have green smoothies on a keto diet? You sure can and Delighted Momma has The Best Low Carb Green Smoothie. Made with the gorgeous spices of Chai Tea and Pumpkin Spice you will love this Chai Pumpkin Keto Smoothie by Healthful Pursuit. While on keto it can feel a bit same old same old with a fat bomb diet, so why not change it up with this amazing Salted Caramel Keto Smoothie from Forget Sugar Friday. Acai is one of the most amazing superfoods and this Acai Almond Butter Smoothie by Perfect Keto is the perfect low carb smoothie to not only feel amazing with ingredients like Keto Collagen but fill you up too. Getting to enjoy a Cinnamon Roll without any of the guilt? Yes please. You can do just that with this Cinnamon Roll Smoothie by The Low Carb Diet. Need something a little different from the usual keto chocolate balls? Try this yummy Keto Chocolate Smoothie from Elana’s Pantry. If you dont feel like making keto fat bomb ice cream, this Low Carb Frozen Peppermint Hot Chocolate by Sugar Free Mom is an easy alternative and tastes divine. How can you resist this crunchy low carb strawberry smoothie? Find recipe at Delighted Momma. With its use of protein powder this Keto Lemon Coconut Smoothie from Tri Holistic Nutrition is just like lchf protein balls but in liquid form! If you look around at some of the liquid bomb weight loss reviews you will see that they work! You need to be sure that you use filling and healthy recipes though and we think this Low Carb Green Smoothie by I Breathe I’m Hungry is a great place to start. Use coconut milk with this Bulletproof Breakfast Chocolate Milkshake from Gnom Gnom to make a liquid version of low carb chocolate coconut balls. We love how different this Sweet Lassi with Rose Water and Cardamom from Low Carb, So Simple is to other fat bombs recipes. Give it a try if you are getting tired of the usual keto flavors. This delicious Strawberry Avocado Smoothie by Wholesome Yum only has four simple ingredients and can be made in minutes. The perfect fast keto snack. We are sure you have heard all the amazing health benefits of Turmeric, why not add it to you diet with this Keto Avocado Smoothie with Coconut Milk, Ginger and Turmeric by Low Carb Maven. If you love fat bomb recipes with cream cheese then you will love this Low Carb Strawberry Cheesecake Shake from Happy Mothering. If you love keto cream cheese balls then we think you will be a hige fan of this Fat-Burning Vanilla Smoothie from Tasteaholics ( Original Recipe The Keto Diet Blog ). With ingredients like mascarpone cheese it makes a great change to your normal cream cheese fat bombs or even white chocolate fat bombs. Iced coffee bomb diet drink makes perfect fat bombs for coffee lovers. Check out this recipe from Keto Connect. Try this delicious smoothie that is sure going to give you plenty of energy. Made with coconut, cocoa and macadamia. Find the recipe at DJ Foodie. This Raspberry & Chocolate Cheesecake Smoothie from The Keto Diet Blog makes a perfect chocolate bomb recipe dessert, especially if you enjoy fat bomb recipes with cream cheese. If you are looking for a hot fat bomb drink then we love this delicious Bulletproof Butterscotch Blondie Fat Bomb Tea by OMG Keto Yum. With a few ways to tweak the recipe it can be made perfectly for you! If you are looking for a tasty alternative to your usual protein bomb recipe then we suggest trying this Chocolate Hazelnut (Nutella) Shake from TJ’s Taste. If you are looking for recipes of fat bombs without artificial sweetener, then savory fat bombs are the right thing for you! Making savory fat bombs may not be as popular as making the sweet treat but you can get all the good ingredients on a savory ball too and they make amazing snacks! 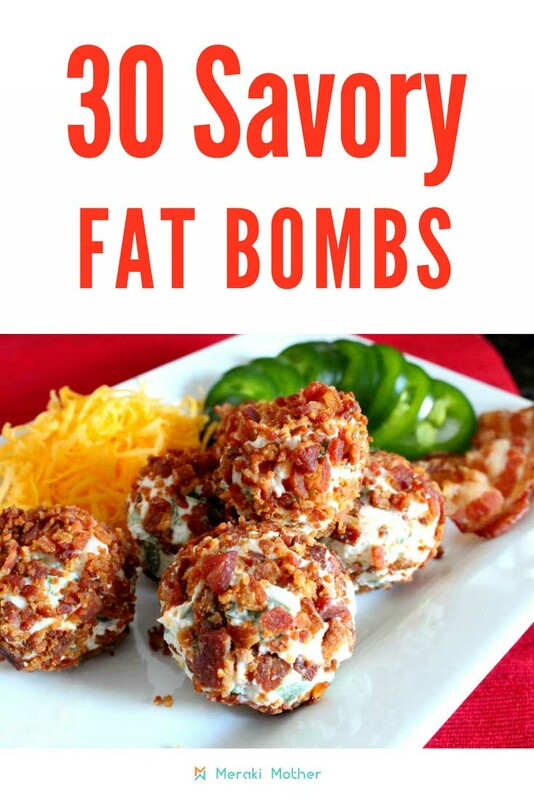 Find below our favorite Keto savory fat bomb recipes. 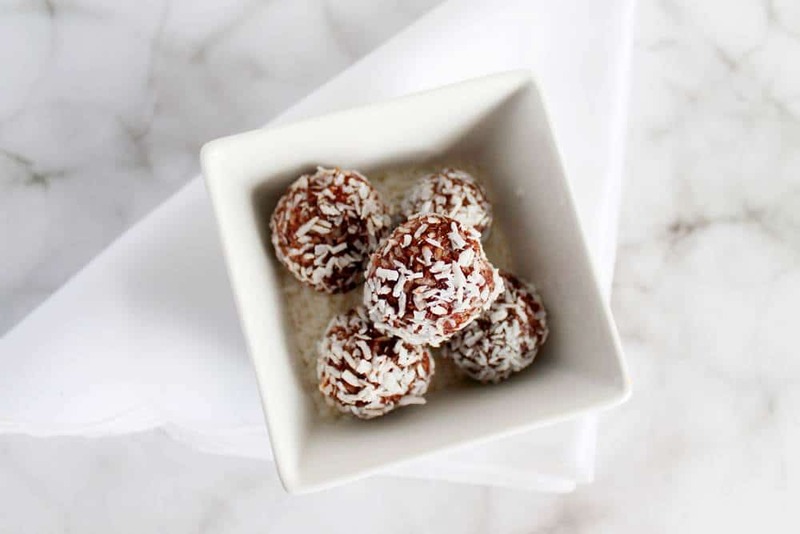 Try cream cheese balls low carb with a bite! 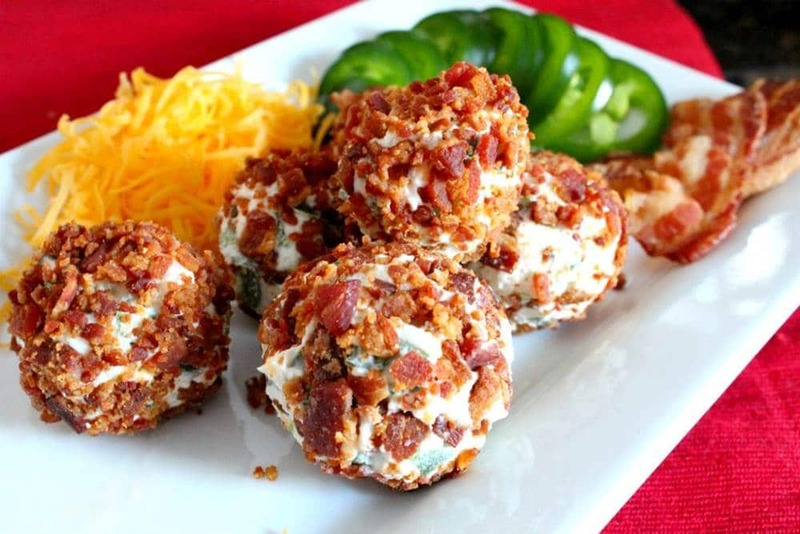 These Jalapeno, Cheese & Bacon Bite Fat Bombs by Health, Home & Happiness are so tasty it will be hard to just eat one. We love avocado. Not only is it one of the lower carb flavors it is also amazing source of best sources of monounsaturated fats and potassium which is vital for a healthy heart. Try these Avocado & Egg Fat Bombs from The Keto Diet Blog to get some avocado into your diet. When you start on the keto diet it can be hard to find foods for when you are entertaining guests. These Keto Bacon Deviled Eggs by Peace, Love & Low Carb are not only the perfect keto snack but also make a great keto appetizer your guests will love too. These Savory Pizza Fat Bombs by ruled.me make a great low carb snack when you are missing the taste of Pizza. We love these Crab Rangoon Fat Bombs from Officially Gluten Free for a tasty afternoon snack that keeps us feeling full. I Breathe I’m Hungry promises these Keto Bacon, Braunshweiger, & Pistachio Truffles are the perfect combination of crunchy, salty, rich, and smooth. Makes us want to try one asap!. While we have heard of a peanut butter bacon bomber recipe we think this Keto Butter Burgers Savory Fat Bomb from Forget Sugar Friday may be more to our taste. How about you? Absolutely yummy baked brie savory fat bombs with pecan prosciutto. Recipe by The Nourished Cave Man. If you love the taste of a tahini fat bomb then these Asian inspired Savory Sesame Fat Bombs from Diet Doctor will be perfect for you. 10. Chipotle Bacon Wrapped Chicken Bites from Low Carb Maven. Full of sweet and smokey flavors these Chipotle Bacon Wrapped Chicken Bites from Low Carb Maven make a great keto snack or keto party food. When you get tried of sweet fat bombs these Savory Salmon Fat Bombs by The Keto Diet Blog taste amazing on top of some low carb greens. These Pistachio + Sundried Tomato Goat Cheese Balls are super easy to make and taste amazing. Head to The Wicked Stuff to find out how. Not only are these Cheddar Cauliflower Bacon Bites amazing and keto…but Sugar Free Mom has discovered a great way to get your kids to eat cauliflower…and love it! Think of a BLT without the high carb bread and you will be close to these Bacon Egg Salad Tomato Bites from Beauty and The Foodie. Peace, Love & Low Carb has used cauliflower to replace high carb rice in these delicious Low Carb Arancini. Missing burgers can be a huge part of being on the keto diet. Luckily with amazing tastes like these Keto Bacon Burger Bombs from ruled.me it is easy to get a buger flavor hit without the carbs. Did someone say Bagel? We love that you don’t have to go without your favorite flavors even on the keto diet. These Everything Bagel and Lox Keto Fat Bombs from Health Starts In The Kitchenare amazing when you are craving high carb bagels but want to stay in ketosis. Pecans don’t have to be sweet. Low Carbe Diem have created this savory Stuffed Pecan Fat Bomb and they are amazing. Make a big batch of these delicious Keto Meatballs by Meraki Mother and store in an airtight container. Then dip in your fav high fat dip for an amazing savory fat bomb. Haven’t got time for a big cooked breakfast? These Bacon Egg and Avocado Savory Fat Bombs from Keto Vale are perfect for a keto breakfast on the go. These Sausage Ball Puffs make a brilliant low carb treat. Head to Kasey Trenum to find out how to make them. With olives and sun-dried tomatoes these Savory Mediterranean Fat Bombs from Keto Diet Blog pack all the tastes of the Mediterranean into one delicious bite. Health Starts In The Kitchen swears even people that don’t like olives will love her Keto Olive Pecan Fat Bombs. So why not give them a try today. Want a zero carb snack? Try these Fried Cheese Sticks from Keto In Pearls. You can never have enough bacon in life and these Breakfast Bacon Fat Bombs, are not only full of bacon but A Simple Pantry has added amazing tastes like Lime and Cilantro. All the usual waldorf flavours of blue-cheese, apple and walnuts in a bite size Martina Slajerova. Full of superfoods and and amazing tastes, you need to try this Pumpkin Butter Slice from The Castaway Kitchen…like yesterday. So fast to make and can be made into fat bomb balls or even used as a keto dip! Be sure to add these Cheesy Pesto Fat Bombs by The Keto Diet Blog to your regular recipes. Head to ruled.me and try these Salmon Benny Breakfast Bombs. A keto egg benedict in bite size! Eggs make such a nutritious and healthy snack. They are perfect for a keto snack, especially when you make them into a fat bomb like Peace, Love & Low Carb has with these Buffalo Chicken Deviled Eggs. What a great roundup of fat bombs! – thank you so much for featuring mine!